I was reading The Transition Handbook in preparation for a workshop next weekend, and there's a couple of great charts showing the carbon intensity (grams of CO2 equivalent produced per kilowatt-hour) and EROEI (Energy Returned on Energy Invested) of various energy sources (although oil is prominent by its absence, I added some in later). Those charts are online at The Ecologist magazine. Although I found them interesting and useful, I thought they would be much more useful if they were combined. 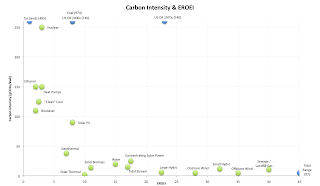 The result is above: a scatter chart showing the relationship between EROEI and Carbon Intensity for various forms of energy. Because a high EROEI is good, we would prefer to use energy sources far to the right. Because low Carbon Intensity is good, we would prefer to use energy sources far down on the chart. Several energy sources were "outliers" -- they didn't fit nicely on the chart as scaled, so they are marked by half cut-off blue dots at the very edge of the plot. Their label includes the actual value, so although the "Tar Sands (465)" dot is at about 260 gCO2e/kwh, the actual value is 465 gCO2e/kwh as indicated by the (465). For any given application, this chart provides a (roughly) optimal ordering of energy sources. Wherever possible, Tidal Range power is the highest EROEI and the lowest (or very very close to the lowest) Carbon Intensity. Next is a choice between Offshore Wind (if you prefer to reduce Carbon Intensity a bit more in exchange for a bit less EROEI) or Sewage / Landfill Gas. And so on. You'll notice that the included petroleum and petroleum like fuels (US oil, tar sands, Coal) are very dirty, except for possibly "Clean" Coal, which doesn't really exist yet. And there are alternatives to each of them which have higher EROEIs. But none of them have the physical energy density that these carbon based fuels like oil have. A simple conclusion is obvious: carbon based fuels should not be used for electrical generation (that's what most of these energy sources are, with the exception of Solar Thermal and the generalized cogeneration of electrical power and heat intrinsic to Sewage / Landfill Gas, Concentrating Solar Power, Solid Biomass, and so on) if any of these other alternatives are available and can supply a significant fraction of the required power.